Over on Facebook, I mentioned having crockpot steel cut oats for breakfast and was asked for the recipe. I love this breakfast because, a)I accidentally ordered 25 lbs of steel cut oats last spring and I need to use them (!!!! 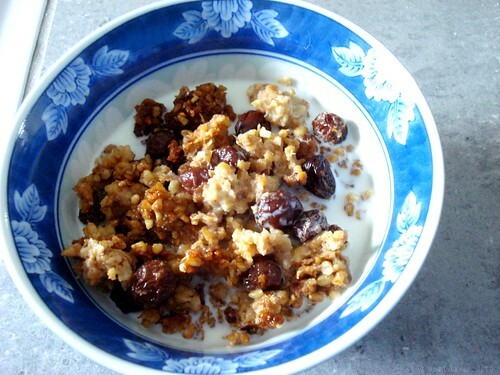 ), b) it's a healthy, easy make-ahead breakfast that everyone likes. As usual, I always double the recipe, and I make it just before I head to bed in the evening. This is an easy recipe to alter by adding different fruit combinations, sweetener and liquid. Also, I used chopped frozen apple that we put up in the fall, instead of fresh, so it's a good way to eat in season and locally. Soon I'm going to try a batch with some of those frozen peaches from our garden. Yum! Enjoy! Combine ingredients in 4 quart crockpot. Mix well. Cover and cook on LOW 6-8 hours. I'm going to make this tonite! It looks perfect. I have an abundance of oats as well. I've been looking for something like this because I love steel cooked oats but they take too long in the morning to make for my impatient breakfasters! :) Thanks for sharing!! Hmm... now I just have to find my crock pot. Ohhhhh, thank you SO much! I've got a whole heap of oats and this will be perfect. I'll make some this weekend, in my old orange crockpot.